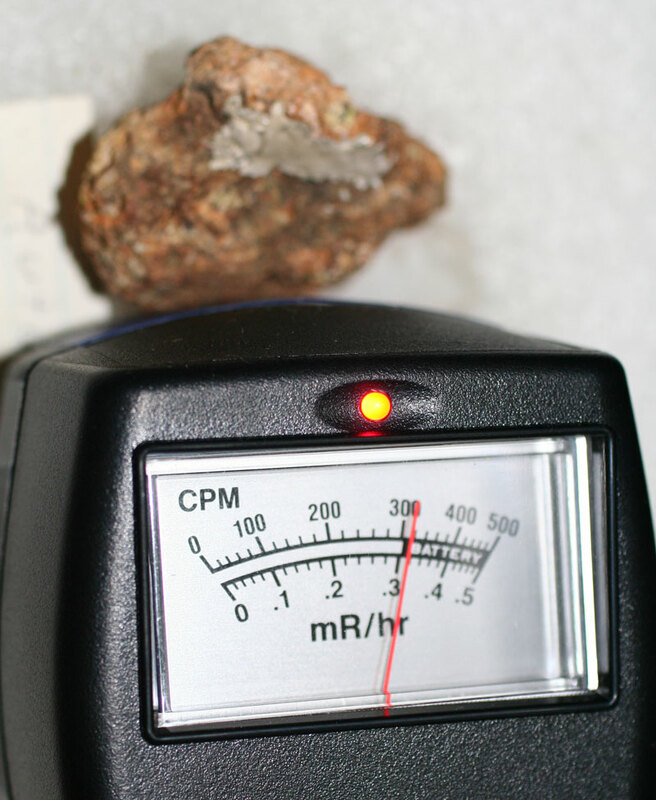 After visiting the Smithsonian National Museum of Natural History and seeing the case with minerals that emit radiation, getting a geiger counter seemed like a good tool to have. So after studying various models I bought a Monitor 4 kit from GiegerCounters.com. 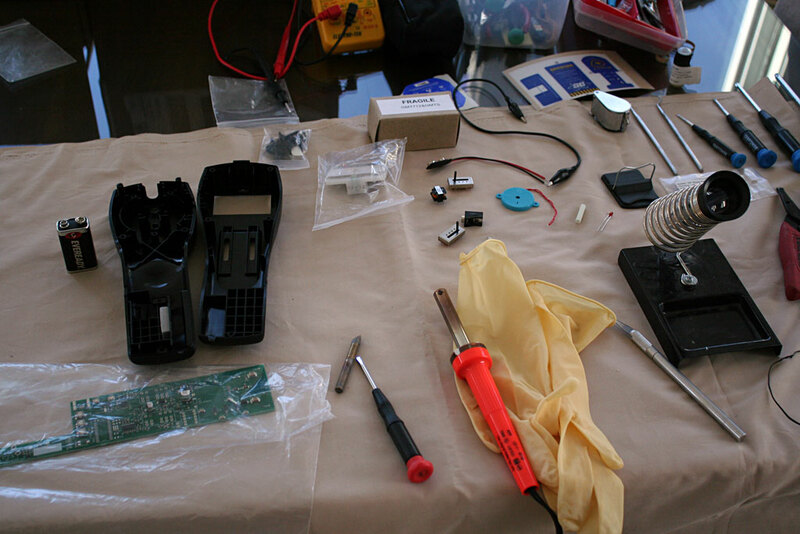 After receiving the kit and reading the through assembly instructions, I took the time to gather my tools. Having never worked with a Geiger-Müller tube before I was apprehensive toward handling it to the point of considering using latex gloves. After seeing the tube casing, it seemed okay to handle [make sure no contact with the mica window]. The first step was solder the transformer and two switches on the already prepared circuit board. The manufacturer S.E. 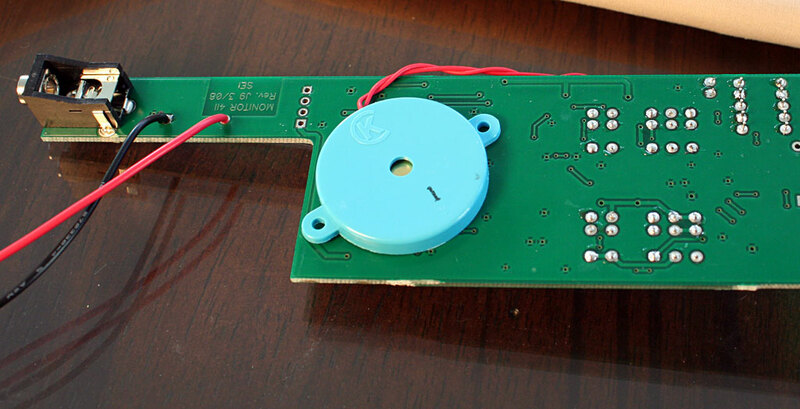 International already has the majority of the components surface mounted then wave soldered on the circuit board. It is up to the assembler to solder the through hole parts. This next image shows the component side of the circuit board with the two switches and transformer installed. 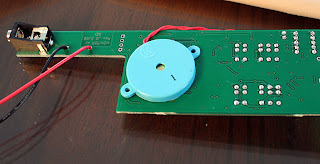 Next the output connector is soldered on and the speaker. After that the 9 volt battery clip that provides power to the board and the LED guide with red LED are attached. A diode to mount the meter to is installed along with a a foam piece for circuit board support. 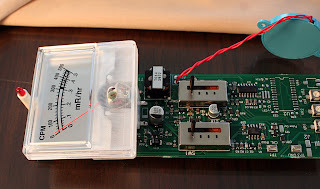 The meter is then soldered to the diode and circuit board foil. Here is a close up of the Geiger-Müller tube probably made in Tennessee. I did not take pictures of this assemble step because I was concentrating on not breaking this tube. Once the wires and tube are connected to the circuit, the tests begin. There are several resistance and voltage checks. For the unit I was building, the resistance check did not quite match what my meter showed and the values the manual supplied. I guess it is possible the meters are not calibrated. The voltage checks all looked good. 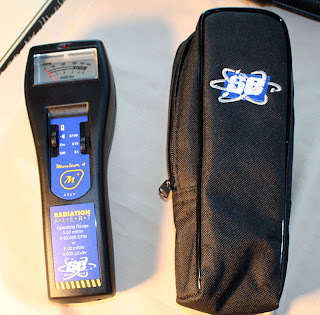 The detector was suppose to detect 5-25 counts per minute (CPM) and I measured 13 CPM and 15 CPM. I then adjusted the three potentiometers to the resistance ranges shown in the manual. A better calibration can be achieved using an oscilloscope and frequency generator. Having neither I am using the detector in its current state of accuracy +/- 20%. After testing the circuit board, the tube, speaker, and battery clip are placed in the bottom half of the case. The top half then fits over that to complete the case. Five screws lock it all together. I still have to put conformal liquid on part of the circuit board to seal the high-voltage components from moisture. Also once I have my digital meters calibrated I will make some adjustments to the detector. The labels were attached to the case. Assembly completed. Fortunately, I found no common items around the house that generate radiation (checked the smoke detectors, granite rock, New Albany shale, potassium chloride salt substitute). The detector has two sets of switches. Switch 1 has an off, on, on with speaker, and battery test setting. Switch 2 has a 1x, 10x, and 100x setting. 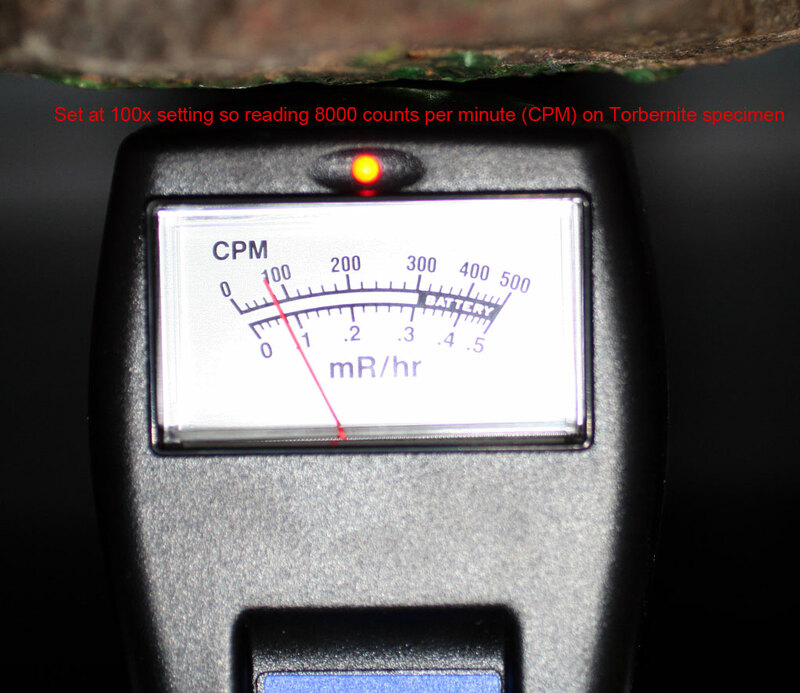 So the analog meter can display 0-50000 CPM. The user outputs are a little red LED, an analog meter, and a speaker. Later, I checked the detector on a Meta-autunite specimen that generated about 300 CPM. It was good to see it working! Setting the detector to 100x it measured about 8000 CPM on a Torbernite mineral specimen. All and all, an interesting experience assembling and testing the Monitor 4. I believe the tool will be useful in finding Uraninite specimens.